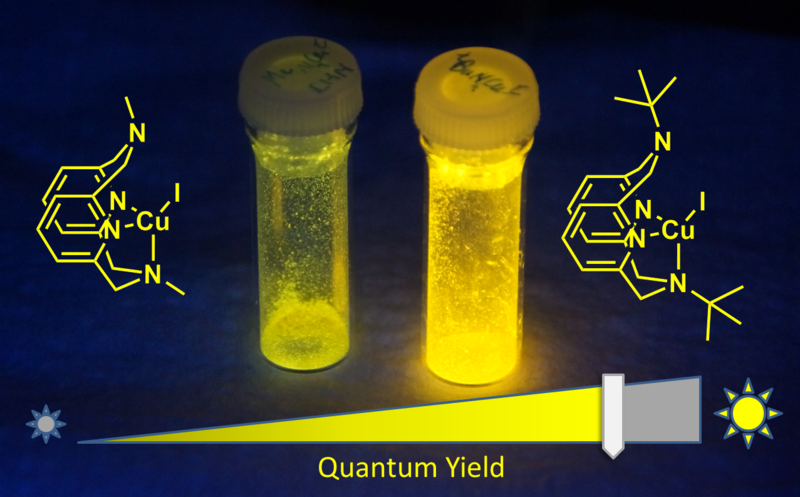 Patil, P. H.; Filonenko, G. A.; Lapointe, S.; Fayzullin, R. R.; Khusnutdinova, J. R. "Interplay between conformational flexibility and photoluminescent properties of mononuclear pyridinophane copper(I) complexes" Inorg. Chem. 2018, 57, 10009-10027. Link. OIST highlight. Jankins, T. C.; Fayzullin, R. R.; Khaskin, E. (CCCU publication) "Three component [1+1+1] cyclopropanation with ruthenium(II)" Preprint at ChemRxiv. Organometallics, 2018 DOI: 10.1021/acs.organomet.8b00361. Rivada-Wheelaghan, O; Aristizábal, S.L. 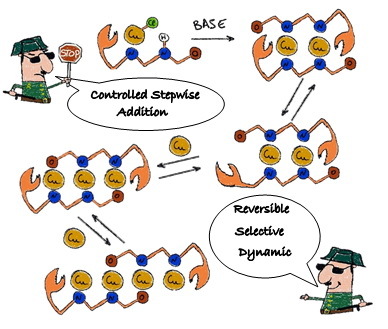 ; López-Serrano, J.; Fayzullin, R. R; Khusnutdinova, J. R. "Controlled and reversible stepwise growth of copper(I) linear chains enabled via dynamic ligand scaffolds" Angew. Chem. Int. Ed. 2017, 56, 16267-16271. Link. OIST highlight: "Building Molecular Wires, One Atom at a Time". 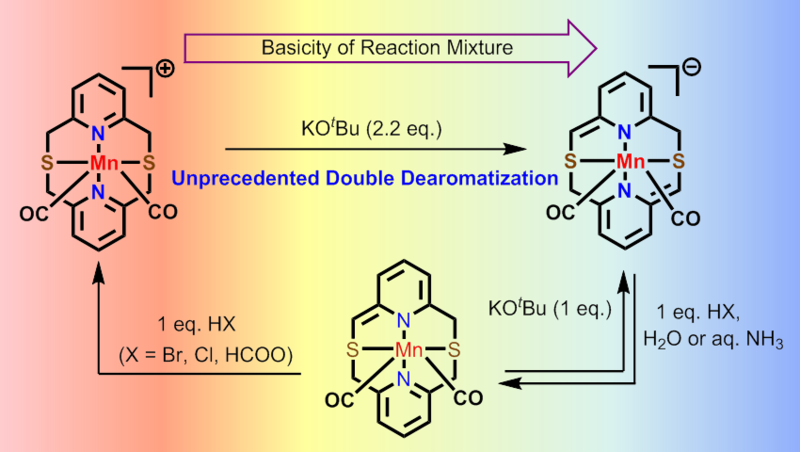 Dubey, A.; Nencini, L.; Fayzullin, R. R.; Nervi, C.; Khusnutdinova, J. R. "Bio-Inspired Mn(I) Complexes for Hydrogenation of CO2 to Formate and Formamide" ACS Catal. 2017, 7, 3864-3868. Link to the paper. OIST Highlight: "Recruiting Manganese to Upgrade Carbon Dioxide". Filonenko, G. A.; Khusnutdinova, J. R. "Dynamic Phosphorescent Probe for Facile and Reversible Stress Sensing" Adv. Mater. 2017, 29, 1700563. Link. Highlighted in OIST News. Filonenko, G. A.; Fayzullin, R. R.; Khusnutdinova, J. R. "Intramolecular Non-Covalent Interactions as a Strategy Towards Controlled Photoluminescence in Copper(I) Complexes" J. Mater. Chem. C. 2017, 5, 1638-1645 Link. Highlighted in OIST News. Lactams from Amines and Water with Liberation of H2” J. Am. Chem. Soc. 2015, 137, 4851-4859. Methanol” ACS Catalysis 2015, 5, 2416-2422. Water As the Oxygen Atom Source” J. Am. Chem. Soc. 2014, 136, 2998-3001.
formation of a Pd(IV)–OH complex and its C–O bond formation reactivity” Chem. Comm. 2014, 50, 3036-3039. Angew. Chem. Int. Ed. 2013, 52, 6269-6272. 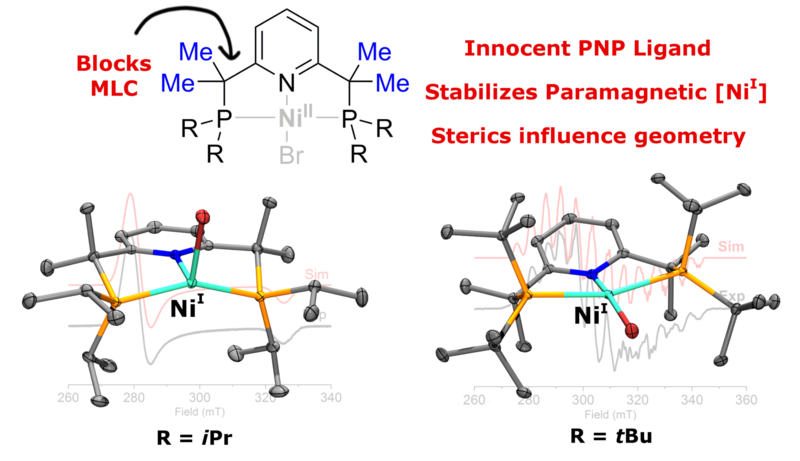 Pyridinophane Ligand: Electronic Properties and Reactivity Implications” Inorg. Chem. 2013, 52, 3920-3932. Organometallic Pd(III) and Pd(IV) Complexes” Dalton Trans. 2012, 14046-14050.
triazacyclononane)” Organometallics, 2012, 31, 4627-4630. Selected for a cover of Organometallics 31(13). Ethane Elimination from a Pd(III) Intermediate” J. Am. Chem. Soc., 2012, 134, 2414-2422.
η3-Allyl PtII Complexes in Water and Aprotic Organic Solvents” Organometallics 2011, 30, 3392-3399. Issue dedicated to Prof. R. G. Bergman 2011, 369, 274-283.
dedicated to Prof. R. J. Puddephatt 2009, 87, 110-120.
cis-Cyclooctene, Norbornene)” J. Am. Chem. Soc. 2008, 130, 2174-2175. (X = 18OH, OH, OMe; L = di(2-pyridyl)methane sulfonate).” Organometallics, 2007, 26, 3466-3483. Complexes (dpms = di(2-pyridyl)methanesulfonate).“ Organometallics 2007, 26, 2402-2413.
in Aqueous Solutions to Produce Methanol and a PtII(OH) Complex.” J. Am. Chem. Soc. 2006, 128, 82-83. 22. Zazybin, A.; Osipova, O.; Khusnutdinova, U.; Aristov, I.; Solomonov, B.; Sokolov, F.; Babashkina, M.; Zabirov, N.
Ligands.” J. Mol. Catal. A: Chem. 2006, 253, 234-238. Catalyzed by Pt(II) Complexes.” Rus. J. Gen. Chem. 2005, 75, 734-738. Tetrachloromethane to Alkenes.” Rus. J. Gen. Chem. 2004, 74, 467-468. Khusnutdinova, J. R.; Mirica, L. M. “Organometallic Pd(III) Complexes in C-C and C-heteroatom Bond Formation Reactions”, invited book chapter in “C-H and C-X Bond Functionalization: Transition Metal Mediation”, Ribas, X., Ed. ; RSC Publishing, 2013.